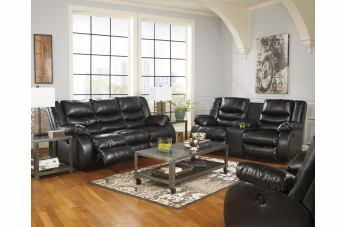 Complete your entertainment or lounge area with the contemporary comfort and style of the Linebacker DuraBlend® series. 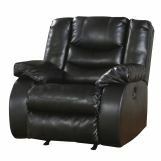 With a rocker recliner, double reclining loveseat with console, and a reclining sofa all available with manual or power recline, this collection is full of options that will make you never want to leave your padded bucket seat. Plush pillow arms are featured on each piece, with stitched and divided seat back cushions designed to give you extra support with a touch of style. The fully padded chaise allows you to enjoy the recline functions with head-to-toe comfort, making it easy to kick back for a quick nap. Created with DuraBlend® fabric in an espresso color, each piece features extra durability to give you long lasting, quality furniture. 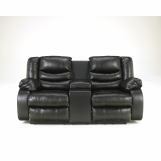 For added convenience, the double reclining loveseats feature a center console with storage and two cup holders, bringing the movie theater experience home to you. 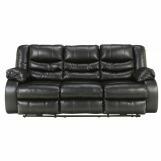 With style and features fit for any home, the ultra comfortable Linebacker Durablend series is full of motion seating options for you to create your perfect lounge or entertainment room.